Posted on Sunday, May 5th, 2013 at 1:31 pm in All Posts, Self Reflection, Self-Help. I’ve been avoiding writing this piece. Why? Because I have a lot of thoughts and a lot of feelings that I haven’t been ready to delve into. There is a pair of mallard ducks that come and hang out in our pool for a few months every year. The female is a mottled brown and has a gentle nature. The male is bolder looking with his green bill and neck. They paddle about, sip water as if it is a delicacy and enjoy the day. They waddle over to the oats I feed them, clumsily as only a duck can. Right now, as I write, the boy duck is sitting by the edge of the pool, relaxing in the sun. Right now, life is good, for him, for me. I was driving home the other day, for a brief stop to pick up my husband. I had a lot on my mind and a lot to do. Racing back and forth across the middle of the road was a panicked female mallard duck, beak open, quacking crazily. I pulled over and got out to see what was going on. And to make sure nobody ran her over. I looked around for a bit trying to understand what was going on when I heard a whistling noise. Baby ducks? I walked towards the sound, and realized the sounds were coming from down a runoff drain. I looked down through the metal grate and about 10 feet below in the muck at the bottom were 9 fluffy yellow and black newly born ducklings huddled. I tugged at the grate on the street above them. It didn’t budge. I started feeling frantic. My mirror neurons turned on full force. The trapped baby ducks, the frantic mother – I was feeling the situation. I felt trapped with them. What could I do? How could I get help? Who could I call? I called the local vet and got some numbers. Meanwhile, a neighbor pulled over. Thank you! I felt glad to be part of a world where other people care. Finally after calling several places, I got through to an animal control center. They promised to send someone over. What would they do, I wondered. What solution would they see? As I waited for somebody to show up, my neighbor called the fire station. My husband arrived. Then the firemen arrived. A bunch of burly firemen got out of their truck and assessed the situation. Two of them were able to lift the grate and one of them crawled down the hole with a plastic tub. He came up a few minutes later with the tub full of little ducks. Now what? I wondered how to get the mother duck and the babies to the wetlands a mile or so away so that everyone survives. But catching an upset and wild duck flying back and forth didn’t seem to be likely, or even a consideration. The man holding the tub of baby ducks decided that the best thing to do was to get the babies back to their mother. We walked down into the yard of the closest house and he tipped the tub over and let the little ducks out. They huddled together on the grass as we backed away and the mother flew in a bit closer. Meanwhile the crows were gathering and moving closer. The baby ducks looked like food to them. The mother duck charged at the closest crow and it flew a bit further away. The woman who lived in the house came out to keep an eye on the situation. I was feeling more and more trapped and hopeless. 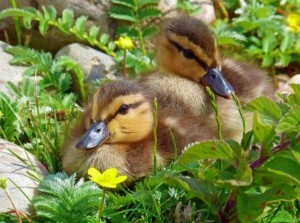 These little ducks were nowhere near a place that would sustain them. They weren’t near water or food. They weren’t safe. I didn’t see any solutions, no answer, and no way to make the situation better. We hung about for a bit, making sure the mother knew where her babies were, and then left hoping for the best. I stopped back at the house on my way home, a few hours later, and knocked on the door. The woman had not seen what had occurred. The ducks, ducklings and crows were all gone and what had happened was anybody’s guess. I felt haunted and upset. What is this life filled with tragedy upon tragedy? The pain of feeling powerless was immense. And I got thrown up against an old conflict: the lack of safety in our world for so many: the reality of death and pain: the destructive intrusion of human structures and systems on much of the natural world. The many things that occur around us that we cannot change and cannot stop. How do we fix the unfixable? I stopped my day for an hour or two to attend to this situation. But how important were the goals I had set up for that day? What about stopping along the way to deal with whatever life has handed us? And how do we balance those two things out, our agenda and idea of what should happen, and what actually occurs? Perhaps I should have called off my entire day and tried to find a way to get the mother duck captured and her ducklings safely moved. Did I do enough? Was there really any more that could be done? And is that even the best use of my time? What do I want my life to be? What am I willing to put my energy towards? What am I willing to let go of? I did stop. I was willing to step out of my agenda and do what I could. It is an important question and for me requires a balance between focusing on the goal, and staying present to the ‘process.’ When I am focused on a bigger project, I have to ‘hunker down’ for days, or weeks, or months on end, and make each day about working towards that goal. I don’t always stop to ‘be’ in the day because getting to the goal is what I am doing. I cut back on other important aspects of life. If I always lived that way, my life would have an impoverishment. And if I didn’t focus like that, I would not create some of the things I have created. I hoped they lived. Just a short time before each one had done the enormous work of pecking themselves out of their oval prison, bit by bit, until the shell fell apart and they felt the space, light and color of the world all around them. I can imagine that moment. In my fantasy, I would have run home for a box. I would have recaptured the ducks after the firemen left. I would have spent the rest of the day moving that box 10 yards at a time, with the mother following. I would have eventually traversed through our neighborhood and gotten to the wetlands. The mother would have followed. I would have let the baby ducks out there. They would not have been eaten by frogs, fish, birds or snakes. Everyone would have been okay. I think that if I had truly believed that I could have succeeded at that, I would have given it a go. I hope I would have let go of the pressure of following the plans and expectations that had already been set up. But between the seeming unlikeliness of getting a flying mother duck with her babies to move a mile through suburbia, and the pressure of getting a bunch of stuff done, I didn’t attempt that possibility. I don’t know how to make the world safe externally. I don’t know how to say that it is okay that a fluffy batch of baby ducks perishes, or a child is killed in a drone strike, or a person is mistreated. We face these dilemmas every day. Do I get involved, or do I avert my eyes and continue as if I do not see what is occurring? When do I let go of what I think I want, and attend to what my life wants of me? How do I even distinguish the difference? For me, I choose to honor the grace of my life. I am so very blessed and lucky that I am living this life. I am so very grateful that I have the experiences I have – pain and all, until it too is my time to leave. And I am lucky that I am not one of those in a ‘bad’ situation. Yet, I feel these other realities – we all do. It is as if we live in a collage of realities. I live in mine, but because I feel other’s realities, they impact me. This brings us to feeling, for it is feeling that links us. Feeling allows our hearts to connect. So much that does not work in our world stems from not being able to feel. Inequality – while it has at its root an incorrect belief, it is our inability to feel another’s reality that allows it to continue. It is much harder to kill or torture or ignore if we can feel the other’s pain. It is the belief that they are ‘bad,’ ‘less than,’ ‘the enemy’ or something else that allows us to rationalize our actions. When we feel, we open up our connection to not just to others, and ourselves but also to our place as a part of our earth. When we feel, we ‘get’ the other’s reality. Instead of disconnection, we are in a relationship of mutual honoring and recognition. I look back and I wonder – Why did I get caught in this? Is it personal? What am I trying to resolve? What does it say about me? I think it speaks to me of looking at my choices, at looking at what is important to me. Our choices determine what our world will be – literally. I also think for me that coming to terms with pain and death means opening to knowing that as physical reality is torn or broken, or blown up, that I can feel the grief of that loss, while also seeing those spirits or that beauty moving into another dimension. While that is what I believe, emotionally I still get stuck in loss. And yet that is okay, for I deeply value this often fragile, beautiful and magical physical world we share. Thank you for so eloquently expressing/mirroring my thoughts and actions when I encounter an animal in danger. Often it is hard to see/understand the “Big Picture”. This story certainly impacted me – in a good way! Thanks for sharing. I have found peace in the loss of two wonderful people lately, I think caring and connection are two very vital emotions, being there for someone in time of need was very fulfilling. We may never know where the ducklings ended up but we do know that without your help they may not even have had a chance or survival. You did a good thing! !